Atrophic Scarring - A loss of tissue or damage to the pore and follicle leaving a pitted or indented scar. There are a few different types - icepick, rolling or boxcar scars. Hypertrophic Scarring - An overgrowth or excess of tissue leaving a raised scar and often called a keloid. Common causes are acne, a cut, cold sores, rash or sunburn. PIH is made worse from sun exposure so the theory that “the sun treats acne” is actually a terrible idea unless you want some lovely PIH! PIH is usually flat and it’s darker than the surrounding skin. Discoloration can range from light to deep brown or even black. PIE is damaged or dilated capillaries (blood vessels) caused by inflammation and trauma. Over exfoliation, sun burns, inflamed acne and are all causes. Dryness and dehydration will also contribute which is unfortunate since many acne treatments are often drying. Squeezing and picking pimples will contribute to that inflammation and trauma. Have you ever attacked a pimple with your finger nails? That absolutely can break blood vessels, so no picking! PIE can vary from pink, red to deep purple. How can I tell the difference between acne scarring, PIH & PIE? 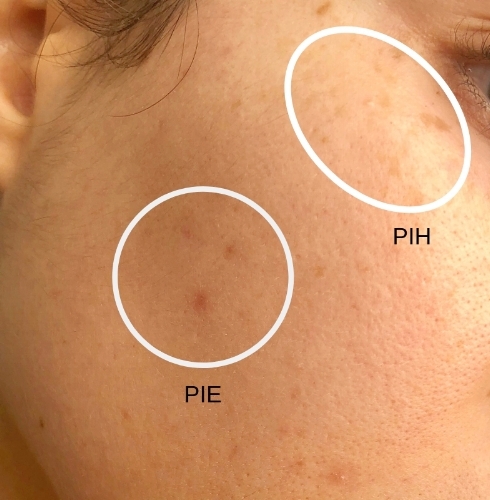 If you have atrophic or hypertrophic acne scarring it’s pretty apparent, however, it can be hard to spot the differences between PIH and PIE and often a person will have a combination of both. In the treatment room, I’ve always performed what I like to refer to as the “press test” during a skin analysis. This is simply applying light pressure to the skin where the suspected PIE or PIH is to see if the skin turns white. This is known as skin blanching which is the temporary restriction of blood vessels. Another test that is basically the same concept but using a clear glass pressed against your face so you can see through it. PIH will be unaffected while PIE will turn white. It may not be 100%, but it’s a helpful guide. Here is a S U P E R up close photo of my face. I had a few PMS pimples about three weeks ago (it has faded a bit already) and you can see the difference between the pink PIE and the brown PIH which I have circled. When I press on the PIE area it disappears for a few seconds confirming to me that it’s PIE. Below are examples of the different types of atrophic or hypertrophic acne scarring. Acne Scarring = damage, loss/overgrowth of tissue to the follicle resulting in an indentation or raised scar. Post Inflammatory Hyperpigmentation (PIH) = ranges of brown to black spots that are melanin. Post Inflammatory Erythema (PIE) = ranges of pink to red spots that are dilated blood vessels. Now that we know the differences and causes I am sure you are wondering how to treat each of these types of marks. While both PIH and PIE can fade on their own, it can take months and it depends on the severity. It may also never go away like my PIH that has been there for years. Acne scarring is bit tricker since there is actual damage to the pore/follicle but there is hope! It really depends on the type of scar and the severity. In my opinion, the most effective options require medical help from a dermatologist. Also, NO PICKING! Cosmetic fillers - Hyaluronic acid cosmetic fillers like Restylane will help to plump out the indentation. Subcision - This is a minor surgical treatment that after some local numbing a needle is inserted under the skin and moved back and forth to break up scar tissue. 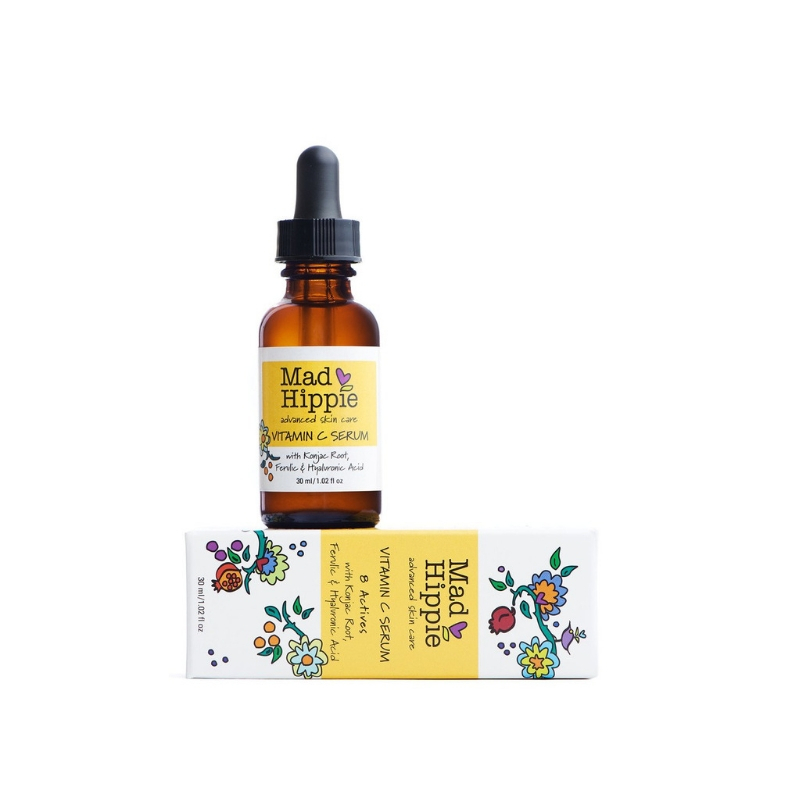 This is ideal for rolling or boxcar acne scarring. Fractional Carbon Dioxide Laser (CO2) - This is a laser treatment that creates microscopic holes in the deeper layers of the skin stimulating collagen a production and helping to smooth out acne scarring. Professional Strength Peels - Medium to deep depth TCA peels help to make scars go from deep to shallow reducing the appearance of them. Professional Depth Microneedling - I say professional depth because I realize you can pick up an inexpensive dermaroller on Amazon for a DIY. However, the depth of needle that is required to effectively, safely and hygienically treat an acne scar will require topical numbing and the skin will bleed. I DO NOT recommend doing this yourself at home. Cortisone injections or a laser resurfacing treatment - This is the best treatment for keloid scarring. Basically, inhibiting melanin production and reducing the amount of sun exposure you receive are the best methods. SUNSCREEN, HATS and SHADE. Not only is preventative, it’s the treatment! Ya dig? Professional Strength Peels - See an esthetician for a monthly series of peels, particularly glycolic acid. Microdermabrasion - Effective for PIH, but I would not recommend this for someone with a combination of both PIE and PIH. Laser Treatments - These are great because you will see results quickly. Intense pulse light (IPL) or Broad Band Laser (BBL) are good options but I would recommend seeing a dermatologist to get a proper recommendation. Time - Not what you want to hear but it’s true, time (and patience) will help fade PIE even with no treatment. Vitamin C - A less commonly talked about benefit of vitamin C serums is that it strengthens the capillary walls. Since PIE is dilated blood vessels this helps to reduce the redness. Vascular Lasers - This is a laser treatment that works by dissipating the pooled blood vessels. Being Gentle - Harsh scrubs/ingredients, picking and squeezing pimples and sun exposure can all make PIE worse. Be gentle! Did I mention no picking and wearing sunscreen? LOL. If you have any questions or blog topics you'd like me to write about feel free to send me a message! Join the conversation on my Facebook Group Babe + Beauties!